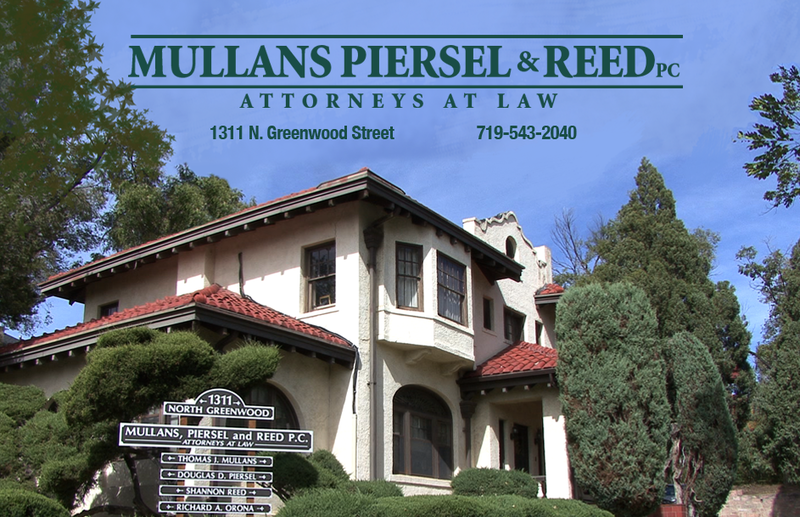 Mullans, Piersel & Reed, one of the top law firms in Southern Colorado. Since 1989, earning a reputation for excellence within the legal and business community. For over 25 years the attorneys at Mullans, Piersel & Reed P.C. have served families, businesses and individuals in Southern Colorado. We are a firm dedicated to providing our clients with superior legal service and experience that is results oriented and cost effective. We have decades of trial experience and are prepared to take your case from inception through trial. Other law firms have sought our guidance in all aspects of litigation and we stand at the forefront of trial knowledge and experience. We pride ourselves on handling legal issues with creativity, sensitivity and foresight. Our expertise extends to personal injury and wrongful death cases. Our extensive experience in representing individuals who have suffered personal injury as a consequence of other people’s negligence enables us to ensure that you are compensated for your injuries. Unlike some other firms our experience trial lawyers are prepared to take your case to trial and will not send your case to outside trial counsel. In addition, we have decades of experience in drafting estate documents ranging from simple wills to complex living trusts. We also provide professional assistance in business legal needs and in the probate and administration of estates. Superior service and proven results are what we strive for at Mullans, Piersel & Reed P.C. From start to finish, we will be there every step of the way! This website is intended to provide general information to the public. The information on Mullans, Piersel & Reed P.C. website is not, and is not intended, to be legal advice. The use of the Internet or this form of communication with the firm or an individual member of the firm does not establish an attorney-client relationship. Your communication with us does not mean we have accepted your case or representation. Confidential or time-sensitive information should not be sent through this form. Mullans, Piersel & Reed P.C.